Food trade shows are a lot of fun for exhibitors and attendees. They also provide important opportunities to connect with a highly targeted audience of key buyers and decision makers in your market. Taking full advantage of these opportunities requires having a food trade show booth that dynamically displays your products and services without breaking your budget. ExpoMarketing has been providing food companies throughout the U.S. with creative food booth ideas and cost-effective food trade show displays since 1991. The original pioneer in the booth rental concept, we carry one of the largest inventories of rental booths in the U.S, including many award-winning designs. Our rental exhibits are unique because they have a custom look and feel – without the high cost of ownership. 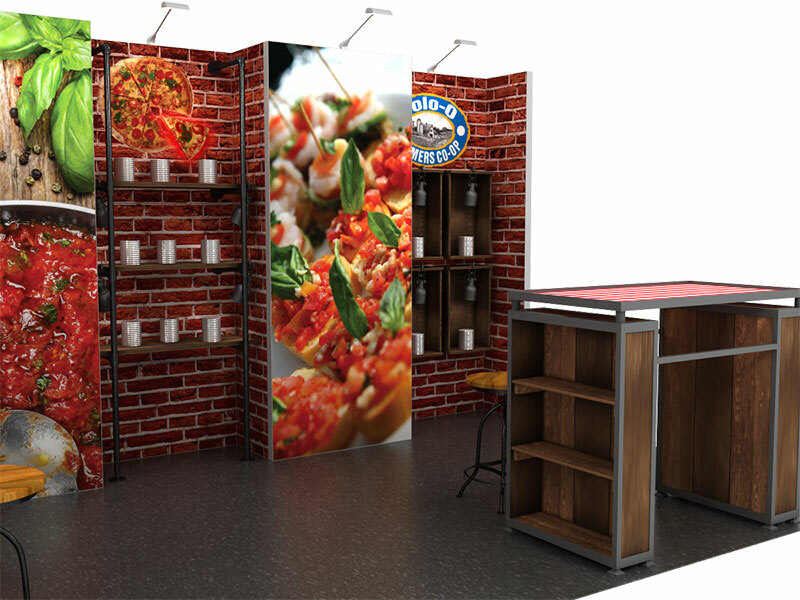 When it comes to food trade show displays, renting is the smarter option for many reasons. Lower design and build costs. You can rent a professional-looking display for far less than owning one. Flexibility. Renting allows you to easily change size, design or both between shows. Reduced show costs. Renting saves money through lower labor, shipping and drayage costs, while also avoiding extra fees for maintenance, refurbishment, pull and prep, and storage. Competitive advantage. Chances are your competitors are already taking advantage of this low-cost approach – you just don’t know it. See more top food and restaurant trade shows at the ExpoMarketing blog. Consumer tastes throughout the country are rapidly changing, and food producers are changing right along with them. Whether out at a restaurant or in their own homes, American eaters want it fast, fresh and natural, including organic! Accordingly, food companies are moving toward foods and food products that don’t contain hormones, artificial sweeteners or other unhealthy ingredients. They’re also offering healthier snacks and desserts, as well as new taste-tempting beverages that aren’t loaded with sugary sweeteners. Regardless of what type of food you sell, trade show attendees don’t just want to look; they want to sample your wares. So it’s important to have a food show display that allows you to prepare and display your food products without restricting traffic flow. 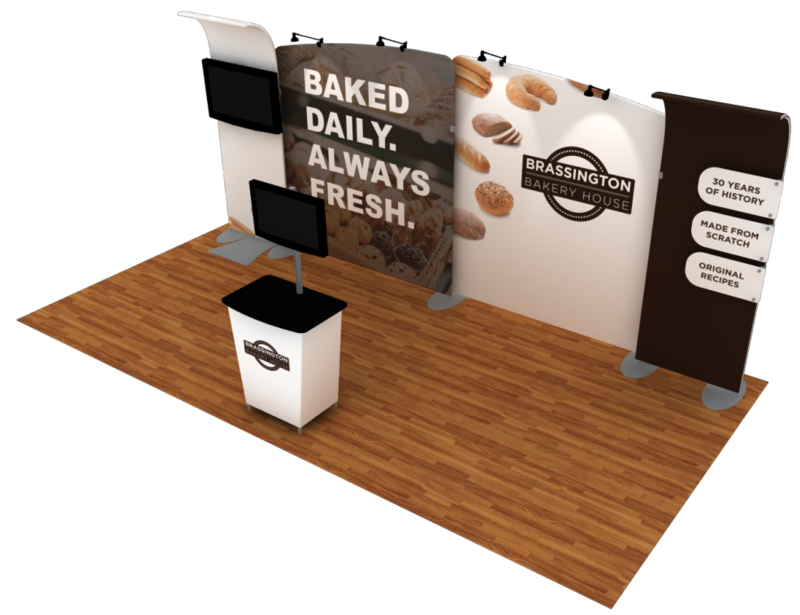 With 25 years experience designing and build successful trade show displays for food companies, ExpoMarketing is the #1 choice for your food trade show booth needs. We offer displays all sizes, from minimal 10’ x 10’ booths to larger island booths and everything in between. More important, our open styles and layouts are specifically designed to integrate the use of food preparation and display equipment into your booth with simplicity and style. With an ExpoMarketing food trade show display, you can focus on interacting with your guests rather than worrying about how to prepare the food. Save time and money on your next food trade show booth. Give ExpoMarketing a call today at (800) 867-3976.